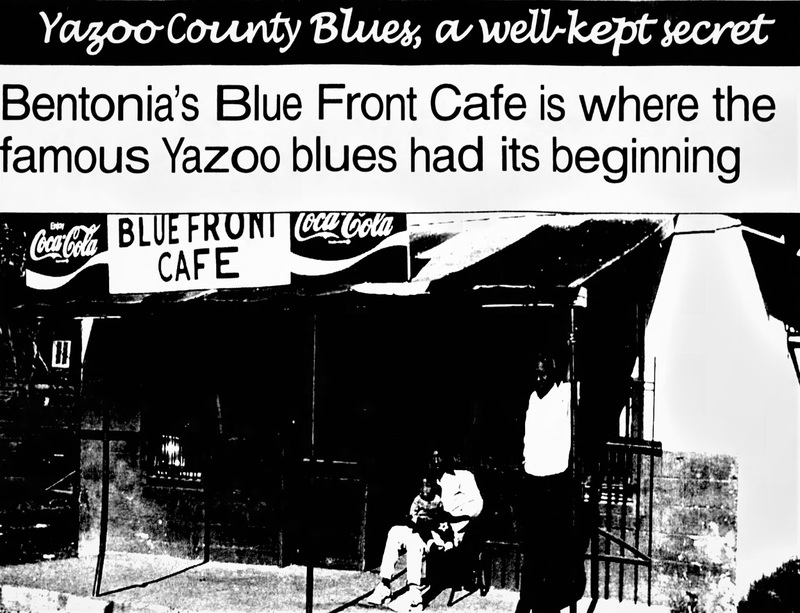 THE BLUE FRONT CAFE in Bentonia is a historic focal point for blues enthusiasts. Owner Jimmy Holmes, standing right, says hardly a week goes by that he doesn't have visitors and telephone calls from Los Angeles, New York, or cities around the world where blues lovers want to found out all they can about the roots of Mississippi Delta—and Yazoo County—blues. Enjoying a Sunday afternoon on the Blue Front porch are Joe Louis Harris and his son, Terrell, of Bentonia. 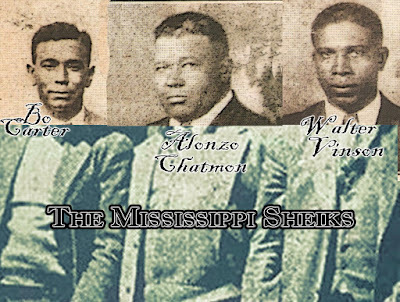 By the time Bentonia's Skip James had recorded his first songs in 1931, the Depression had pushed record company executives to establish two policies: (A) blues singers would be men, not women, and (B) blues music would be performed by and marketed to blacks--not whites. The first notable hit by a blues singer had been Mamie Smith's "Crazy Blues" of 1920, which sold 75,000 copies in its first month. The other early stars had included "Ma" Rainey and Bessie Smith, who traveled the vaudeville circuits with full jazz bands; Bessie was accompanied in the studio by the likes of Louis Armstrong on cornet, Fletch Henderson on piano, and Benny Goodman on clarinet. Meanwhile, Meridian Jimmie Rodgers and his early imitators, including Gene Autry, sang "T. B. Blues" and "In the Jailhouse Now, No. 2." Due to the "race record" policy Rodgers and Autry would become "country musicians" and stick to tunes like "Waiting for a Train" and "Back in the Saddle Again." In order to cut costs and simplify marketing, the search was on for individual black men who played guitars and sang. So Mary Johnson (born Mary Smith about 1900 in Eden) was fortunate to be able to record at the Paramount Studios in 1930. She is known to be the author of at least ten tunes; as well, it seems likely that she wrote the most widely recorded blues song, "Baby Please Don't Go." Big Joe Williams, first to record this tune on December 12, 1941, testified that Mary was the source of this blues song which has seen over 200 versions. Only two of her songs are still available. Vol. 11 of Rhino's Blues Masters: Classic Blues Women will give the listener a chance to hear Mamie Smith, "Ma" Rainey, Bessie Smith, and Mary Johnson, singing her "Barrel House Flat Blues". The little that is known about either Tommy McClennan, "born near Yazoo City" April 8, 1908, or Robert Petway, "born near Yazoo City," comes from the testimony of Big Bill Broonzy, the first Mississippi bluesman to record. McClennan's 42 songs for a Chicago recording firm are all available on the two CD set Tommy McClennan, The Bluebird Recordings, 1939-1942. 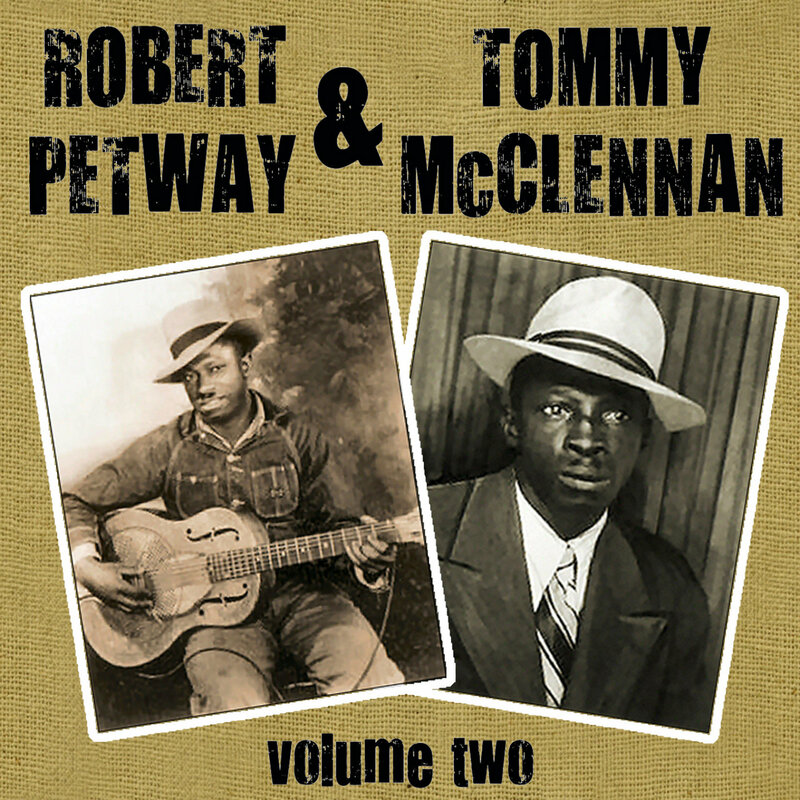 Petway’s 14 songs recorded in 1941 and 1942 can be found on Mississippi Blues by the Wolf label, Vienna Austria, an indication of the popularity of blues music in Europe. Both McClennan and Petway are capable of playing their acoustic guitars fast and loud. Both sing with great enthusiasm, often laughing. McClennan's best known songs are "Bottle It Up and Go" and "Cross Cut Saw." Petway was a trend setter. His "Catfish Blues" was reworked by Muddy Waters for his 1950 breakthrough "Rollin' Stone," which, in turn, was to influence some British rockers so much that they named their band for this take on Petway's song. America was starting to come out of the Depression due to the arms buildup and World War II; the producers in Chicago could afford to have major Bluebird artists accompanied by an upright bass, and sometimes, a rhythm guitarist. The Chicago blues band, finally realized by Muddy Waters and associates around 1950, was slowly developing.